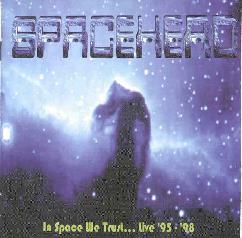 Spacehead - "In Space We Trust... Live 95-'98"
The new CD release from Spacehead is a collection of material recorded since 1996's "Of Stars And Time" and features three different lineups assembled by Mr Dibs since Phil Howard's departure from the band. (Phil recorded a cassette release as Cellular Structure and has since formed the band PXR-1.) Though not considered the official studio follow up to "Of Stars And Time" it is still a marvelous representation of Spacehead's Hawkwind style spacerock. The disc starts on a frightening note with "Mechanoid Dream". Introductory swirling synths provide the background for voicings that tell how in the future robots will do all mankinds work, even clothe and feed us. But then a voice says, "Robots throughout the world. We command you to murder mankind"! And the tune launches into a standard Spacehead blitzkreig. Bashing space guitars, bubbling synths, thumping bass line, and Mr Dibs' dark vocal style. "Mechanoid Dream" doesn't really end but blends into "Dark Star", Spacehead's version of the Krel tune (both Dibs and Phil were members of Krel). I haven't heard the Krel original so I can't compare, but it doesn't matter cause Spacehead rocks out at a frantic pace on this tune. These and the next two tracks ("Third Age Of Magic" and "Spiral Tribes") are both from the cassette only release "Anasazi" and feature the lineup of Mr Dibs on vocals, bass, samples and effects, Will Brazier-Smith on guitar, Paul Boers on drums, and Gavin Maelstrom on keyboards. The style is very much like "Of Stars And Time" though I think Will B-S's guitar playing is much better and stretches out more than heard on the first CD. The next six tracks were recorded 10/20/97 when Spacehead were opening for Hawkwind and feature a new lineup of Mr Dibs, Paul Boers, ex-Gong member Graham Clark on violin and gliss guitar, and Krel's Martin M. guesting on keyboards. The addition of Clark's violin brings Spacehead into a different direction, and, to this listener, is their best material yet. The basic Spacehead sound is intact but Clark's crack violin playing featured as lead instrument makes the music far more exciting and brings a new level of instrumental proficiency to the band. Spacehead hasn't lost their heavy raw edge but the addition of the violin is an interesting and welcome change. Listen to "Astroman" here and on Of Stars And Time and judge for yourself. Probably my favorite tracks on the disc are "Upside Jam" and "Aero Pharaohs", two parts of what are essentially one tune. "Upside Jam" is just a two minute instrumental that features a smokin' violin journey backed by a jamming rhythm section and cosmic space synths. It blends into Pharaohs which continues the jam for a while until becoming a song that has a basic riff that sounds a lot like Golden Void. The final two tracks are a cover of Hawkwind's "Where Are They Now" and a bonus track ("Space Junk") which I believe is a newer studio tune. This lineup consists of Dibs and Clark, plus Ken Jones on drums and Nick Aitch on samples and effects. "Space Junk" is unlike anything I've heard from Spacehead. It's an electronic piece with an industrial edge and a hint of techno. Interesting. This is essential listening for Hawkwind fans as Spacehead do wonders with the heavy Hawk style of spacerock. I'll be looking forward to the next studio release from this lineup. We threw a few questions at Mr Dibs who filled us in on the band's activities. AI: In Space We Trust lists three personnel lineups. Has Spacehead been struggling to keep stable since Of Stars And Time? Dibs: Yes, we have had quite a few line-up changes since "Of Stars And Time" but each one has improved the work we have been doing since that album was released. Phil the keyboards player had left the band and it took some time to replace him. We got another keyboards player for the 'Anasazi' cassette album but that was short-lived and up until recently all the keyboards and effects have been done by myself and put down onto backing tapes. We do occasionally use Martin Needham from Dr Hasbeen. The main problem we've had is with drummers (we've even had Richard Chadwick, Hawkwind's drummer, play one gig with us when one guy left the band at short notice). Currently we are sharing a drummer with another band, Flaw, who play different music from us. He's called Gary Debnberry. He's young and enthusiastic and has fit in extremely well. In spite of all these changes we have not really struggled. Each change has added new and exciting dimensions to the shape and sound of Spacehead. 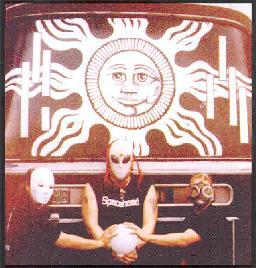 AI: Did Spacehead begin as a Mr Dibs / Phil Howard duo project? Has Spacehead evolved into a "band" project or is it more a vehicle for Mr Dib's musical vision? Dibs: Spacehead had actually begun as a solo project after I had left Krel, just to get me back into doing something, and Phil H, who had been with Krel for a short while, offered to help out. We were quite taken aback by the excellent response that our first cassette album "Sentinel" got, so Phil decided to keep at it for a while. It was more a vehicle for my musical visions then, but now it is much more of a band project, although I still write all of the lyrics and most of the initial riffs. AI: I notice Martin M's name quite a bit in the liner notes. Does Spacehead maintain close ties with Krel in terms of playing shows together and recording together and such? Dibs: I actually had little contact with Krel for a while after I left, but the situation soon resolved itself. Martin M appears on several tracks on the CD as we worked with him to play keyboards at a couple of gigs we did supporting Hawkwind in '97. There has been talk of doing some Krel/Spacehead shows which may happen around the end of the year. It's good that we keep in touch, even though the musical directions of each of us has gone off at different tangents. AI: Any other bands you've played with we should (would) know about? Dibs: I have been doing audio generator for Dr Hasbeen, and Martin from that band has done a show of Hawkwind material performing as the Star Rats. At a gig in Hamburg recently, I jammed on a couple of numbers with the Berlin band Zone Six. AI: How many cassette releases does Spacehead have other than the CD's? Dibs: We have released four cassette albums, "Sentinel" in '94, "The Question Remains" in '95, "Anasazi" in '96 and "Inhalator" in '98, the latter being a bootleg I came across which, after some gentle persuasion, I got the master and ran copies off myself. I have had real trouble with ex-members keeping tapes of stuff and then losing them. "Inhalator" is going to be remastered properly and some extra stuff added, such as bits of a "Spacehead Unplugged" we did earlier this year, and then put onto CD-R.
AI: How did you hook up with Hawkwind for recording on EBS and playing shows with the band? Dibs: The EBS situation came about after a phone call I got from Dave Brock and after the label had been started. I had met Dave before, backstage at Hawkwind gigs and got to know them better especially when Krel supported Hawkwind on the "Electric Teepee" tour, and we kept in touch since then. In '97, I went to see them at the Whitby Dracfest and got talking to Dave again. They needed a bus driver for the "Welcome To The Future" tour and I ended up doing that, which was great fun. At one venue, I was sound-checking Ron's bass for him, we were running through "Ejection", and at the end he just asked Dave whether it was OK if I did that for the rest of the tour, which I did. That was a dream gig, on stage playing bass with Hawkwind. AI: I think Graham Clark's violin has been a wonderful embellishment to the music. How do you view his joining the band in the context of Spacehead's musical evolution? Dibs: Originally Graham was jamming with us at the odd gig here and there. Then when the guitarist at the time left, Graham stood in to help and has been doing it ever since. He also plays more guitar these days. Graham's presence has been an immense boost for the band, both musically and professionally. He has really helped to gel the band together, and I am really looking forward to making the next studio album proper. This is the best Spacehead line-up yet. AI: "Space Junk" is much more purely electronic/ambient than most other Spacehead music. Is this a mere exploration or a taste of things to come? Dibs: The track "Space Junk" is just an exploration of ideas. Our engineer, Nick Aitch has his own project Varja and I basically took him some of my backing tapes and let him run free with them. There may be a few more bits of this to come but only the odd bit. I may do an album of this sort of stuff but not as Spacehead. AI: It's cool that you dedicated In Space We Trust to John Glenn. He's our Senator here in Ohio. A lot of people in the USA criticized it as a big hype thing (Glenn's return to space), but I feel that few people who experience what he did get to relive it again in the twilight of their lives. Dibs: I've been into the space program since I was a kid. I think its development is an essential step in human evolution and it pisses me off that politics gets involved because, had it not been for the USA/USSR space race, we'd already probably have manned bases on the moon, a space station, men on Mars, probably even further. John Glenn gave me hope that I may still get a chance to go out into space one day. Dibs: Well, in August/September we are going to start recording a new album. I've got most of the songs written in basic form. We have just done the North German Hawkfan Space Party and we are playing a festival here in Buxton (Derbyshire) with Hawkwind, Arthur Brown, Bedouin and many more. We are going to be doing a European tour next spring and eventually some USA dates taking in next years "Strange Daze" show. I have a feeling that we will be doing more shows with Hawkwind and I'd like Dave Brock to produce our next album. So I expect year 2000 to be a really busy year for us. Thanks to AndyG for arranging the cyber-interview with Mr Dibs. For more information you can visit the Dead Earnest web site.